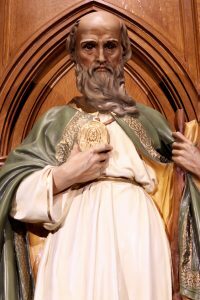 O glorious Apostle, Saint Jude Thaddeus, true relative of Jesus and Mary, I salute you through the Most Sacred Heart of Jesus! Through this Heart, I praise and thank God for the graces He has bestowed upon you. Humbly prostrate before you, I implore you through this Heart to look down upon me with compassion. Oh, despise not my poor prayers; let not my trust be confounded! To you God has granted the privilege of aiding mankind in the most desperate cases. Oh, come to my aid, that I may praise the mercies of God! All my life, I will be grateful to you and will be your faithful client until I can thank you in Heaven. Amen. Pray for us, that before death, we may expiate all our sins by sincere repentance and the worthy reception of the holy sacrament. Pray for us that we may appease the Divine Justice and obtain a favorable judgment. Pray for us, that we may be admitted into the company of the blessed to rejoice in the presence of our God forever. O glorious Apostle, martyr and relative of Jesus, Saint Jude Thaddeus, who did spread the true Faith among the most barbarous and distant nations; who did win to the obedience of Jesus Christ many tribes and peoples, by the power of His holy word, grant I beseech you, that from this day I may renounce every sinful habit, that I may be preserved from all evil thoughts, that I may always obtain your assistance, particularly in every danger and difficulty and that I may safely reach the heavenly country with you, to adore the Most Holy Trinity – the Father, Son and Holy Spirit – forever and ever.